Retreat into the indulgent seclusion of luxury accommodation that is exclusive to Belmont at Beechworth. Nestled in a picturesque tree lined avenue within walking distance of the historic village of Beechworth, Belmont offers the very best in luxury self contained accommodation. Ideal for a couples romantic country retreat or a getaway for up to four adults. Cycle and pet friendly, Belmont entices you to soak in the fresh, country air and mountain views of North East Victoria on the Murray to Mountains Rail Trail. Explore the village of Beechworth, rich in gold rush and bushranger history. Stroll around Beechworth as you discover the eclectic mix of galleries and collectables, handcrafted fine food and beer, hatted restaurants and cafes. Walk over the century old original flagstone step of Belmont. Meticulously renovated, enter a bygone era with Belmont’s modern twist. Enjoy the latest modern appliances in Belmont’s fully self contained kitchen, sink into the generous leather sofas, or listen to the crackle of an open fireplace as you rejuvenate in a luxurious freestanding cast iron bath. Belmont beckons you to relax, indulge and unwind. Two identical bedrooms with private bathrooms and open fireplaces. A contemporary self contained kitchen, fully equipped with quality Miele appliances and Espresso Coffee machine. A secluded garden and suspended balcony. 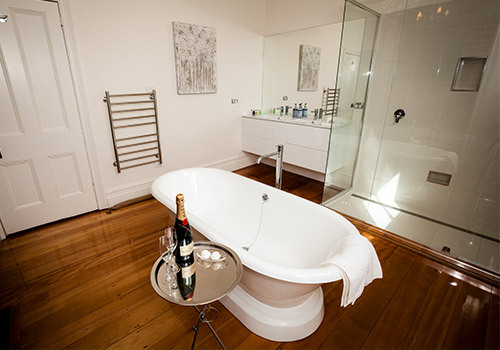 Indulge in the luxury self contained accommodation of Belmont in the heart of Beechworth, North East Victoria. Say thank you, I love you or celebrate with that someone special by giving a Belmont Luxury Self Contained Accommodation Gift Certificate. Join the Beechworth village in celebrating one of their many festivals held throughout the year or see what’s on during your stay at Belmont. Check out our current booking deails and latest offers. © Copyright 2018, Belmont at Beechworth. All Rights Reserved.